As we approach awards season there are finalists being announced, grand finals and gala dinners being planned, and application deadlines approaching for all sorts of business awards. For many women running a small business by themselves, winning any sort of business award seems a distant dream, not the sort of thing someone like us can achieve. But wait, it’s not often we are wrong I know, actually there are lots of women like us out there winning these business awards. I should know – I’m one of them! In 2015 I made the decision to enter the Best New Business category in our local FSB Business Awards, with just days to the deadline. I had thought about it for a few weeks, going backwards and forwards on whether to do it or not, and decided to have a go, just as a practice run for filling in the application for future awards and no-one needed to know so if nothing happened then I wouldn’t feel bad about it. I seriously under-estimated how long these things take to fill in! Not just the writing, but then refining it down into their word limit but still making sure you cover everything, and then gathering and presenting the evidence to back up everything you said. We are talking a good 20 hours of solid work, but as I said it was only days until the deadline, so I saw a few very late nights. Typical then that the deadline was extended just as I’d done my third super late night in a row. It paid off though, as I was a finalist and attended the awards ceremony to come runner-up. As well as getting that far, another benefit of completing the application was that you really have to analyse your business, highlight your successes and can clearly see what you have achieved. Seeing it there in black and white, showing why I really could be a winner, was amazing. Sometimes I think I’m ‘just doing my job’ but when I read the testimonials, and see the growth of the business in stats and figures, I’m actually running a successful business. And the awards organisers do an awful lot of promotion, which if you are a finalist is great as you will get many mentions in various platforms. 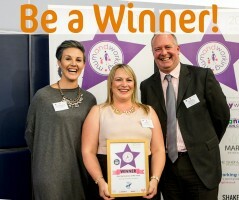 I researched all sorts of other business awards going on locally and nationally, and found one just for working mums, so next I entered the Mum and Working Awards in the Start-Up Business of the Year category. Once you have put the time, effort and tears into one awards application, much of it can be re-used for others and tweaked to suit the new criteria or questions. So it wasn’t such a hard slog to apply for this award, but I had to re-write it to highlight the fact I was a working mum and working a successful business around my family. When I was shortlisted in this category, I then had a telephone interview with the judge which was quite nerve wracking, but I must have done well as I was then informed I was a finalist. The ceremony was in London, with celebrity business mums Caprice Bourret and Annabel Karmel sharing their stories of growing successful empires around young children. Both were witty, inspiring and obviously share the juggle of running a business when you have little ones. You know what happens next, you’ve seen the photo! The good news was I WON! My judge Anne-Marie Martin, founder of Diddi Dance said: “the winner for best start up for me, encompassed the whole judging criteria [the founder being a parent operating within a ‘family friendly’ model with a successful business concept, positive early trading figures and forecasts and a business with real potential]. I felt Synergy Business Support showed fantastic growth with strong figures and Carli offered true flexible working opportunities for her team, congratulations”. The bad news was they asked me to make a speech and I hadn’t realised I was meant to as my award was first, so I didn’t have anything at all prepared or even thought about. Let’s just say I rambled on a bit, and forgot to thank my mum like at the Oscars. The final step on my awards journey last year was the Best Business Women awards, which recognised the achievements of female entrepreneurs running successful businesses while juggling the needs of their families. This was a tough one, with a really high entry rate. I was lucky to get through to finalist in one out of three I entered, Best Woman in Business Services. And with finalist, runner-up and winner I had three good results from the three awards I entered! Find awards to suit your niche or industry, or your local area. The Herts FSB Business Awards was local but attracted a wide range of businesses, the ones aimed at mums or women in business suited me more. Attend information events and meet the judges and past winners. Many awards have launch events where you can learn what they are looking for and how to make a great application. Check the criteria in advance, if you think you might apply next year have a look this year at the criteria and plan what evidence you might need to gather. Read the application form as soon as you can. Make sure you understand what it is asking for, start planning your answers, write a draft and gather your evidence. Never underestimate how long it takes to complete the application. With several drafts, proofreading the finished piece, printing and presentation, collating the evidence, you should be starting weeks before the deadline, especially if you have other things to do, like actually working. Proof read – Get it read by someone else, more than one person if possible, to spell check and sense check it, and see if you have answered all the criteria. You can’t beat a fresh pair of eyes on something as important as this. Make your application creative and interesting, walls of text are boring for anyone to read, never mind judges that are looking at lots of applications in a short space of time. Include some visuals, photos or infographics where you can. Shout about it if you are nominated, even more so if you win. Use the opportunity to get some press coverage, local radio interviews, post about it on your social media and anywhere else you can. I had an excellent PR service from Elvia Marketing, who got 2 massive pieces in the local newspaper!